TaylorMade M5 Drivers with full custom fit options available. When a driver goes straight in to the bag of Dustin Johnson and Rory McIlroy you know that you’re on to a winner and that has been the case with the new TaylorMade M5 driver also with full custom fit options online. All TaylorMade M5 driver heads have been injected individually with speed foam to ensure that the maximum legal ball speed limit is reached with every club head. A tuning resin has been injected into each individual head after the head has been speed tested. This tuning resin has allowed TaylorMade to maximise the COR(coefficient of restitution) of the driver face and achieve a performance at or very close to the legal COR limit. The COR is a measurement of energy transfer between two colliding bodies, which is one of the ways the USGA and The R & A determine if a golf club is legal for competitive play. The continued use of TwistFace technology means that TaylorMade can maximise forgiveness on off-centre hits due to the TwistFace’s unique High Toe loft and lower loft in the heel design. 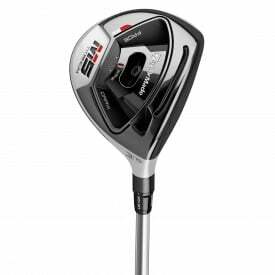 Combined with the new Speed Injection and the new more flexible Hammerhead Technology, Taylormade have been able to create not only the most forgiving driver but also have been able to deliver even greater ball speed than the previous M3 model. A minor but significant change to the M5 driver is a change from the Y-Track system used in the M3 driver to the new T-Track system. The T-Track system has been used with the TaylorMade M1 but was positioned at the front of the head. The new T-Track system in the M5 driver has been positioned at the back; this has allowed TaylorMade to move the weight further back and increase the MOI (Moment of Inertia/forgiveness) and lower the centre of gravity.